It’s been 3 months now since I started using NIOD, some of the most advanced skincare products on the market, and my skin is really showing results. Gone is my dehydrated, flaky skin. Gone are the strange bumps and spots I had after a year of using stage make up. Instead I have nourished skin that is neither dry nor oily (and yes you CAN have both at the same time), that for the first time in my life is just… normal. Nice normal. Normal as in how skin is meant to be. Even in tone and even in colour. And to my eye, tighter and plumper. Wow. Here I’m going to talk about some of their other products, that although not strictly necessary, are somehow miraculous and trust me, you ARE going to want them. I’ve always had a deep suspicion about neck creams. Surely just the same sort of cream as for the rest of your face but with “neck” written on the jar in a ruse to get people to spend more money? It’s true that necks tend to age faster as they respond to all the movements in the lower part of the face, and as we age and lose elasticity in the skin, the first place it will show is in the neck. And I think most would agree that a wrinkled jowly neck (which also leads to jawline sagging) is not a great look. So how is NEC different to other neck creams? Similar in texture to Hydration Vaccine (but slightly yellowish), it uses a host of technologies to restore elasticity to the skin. It does this by inhibiting the key enzyme that breaks down elastin, supports protein synthesis for building elastin and restores fibroblasts. This is an extremely abbreviated version of what it does in an effort not to bore, but the result is an increase in skin density as it tones and evens out skin. It’s main focus is elasticity rather than lines and wrinkles (which are tackled by the 2 core products, CAIS and MMHC). It’s used after the core products (or if using other products, after serums but before heavy creams) in the morning and at night. You use it on the neck and lower face along the jawline. Hydration Vaccine is then applied to the rest of the face and over the NEC if you feel it’s needed. I found the texture quite similar to HV so didn’t feel the need to put anything over it. 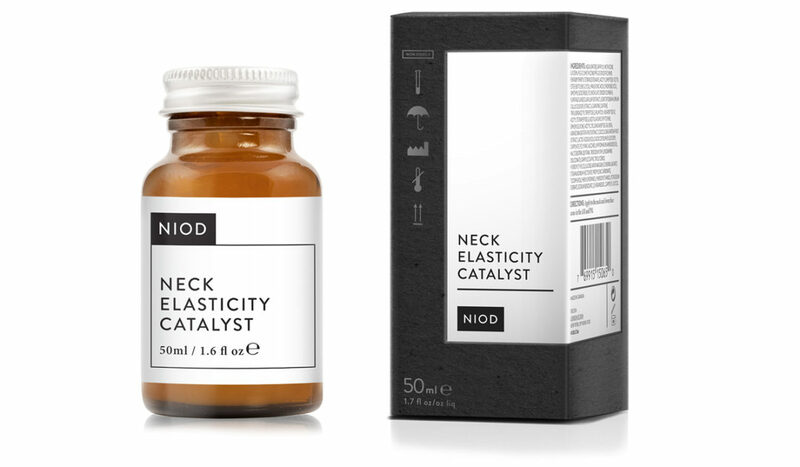 I definitely see a firmness and a sort of bounciness return to my skin in this area (it took a good month or so to see the result), so would say if you’re going to go for some NIOD products, this is well worth including if you can. This is a serum (looks like a light oil despite being oil free) that is used on upper lids of eyes and underneath. It tackles puffiness and dark circles as well as all those lines around the eye (of which I have plenty). And in common with NEC, it also restores elasticity to the eye area. This innocent looking little serum uses 28 different technologies including something I’ve never heard of in skincare before, “drone” technology. It’s all about targeting and getting the right ingredients to the right places. One little drop is all that’s needed for each eye, so this bottle lasts a long time. Use twice a day. I use on top of MMHC and sometime will use a little HV on top although it’s not really necessary. Results are fast with this one and I could see improvement within a week! Quite amazing. I’ll be doing one more article on NIOD. There are another couple products that are pure luxury but are possibly my favourites because they can really give a glow to your skin when needed. And the make up world is buzzing about them. 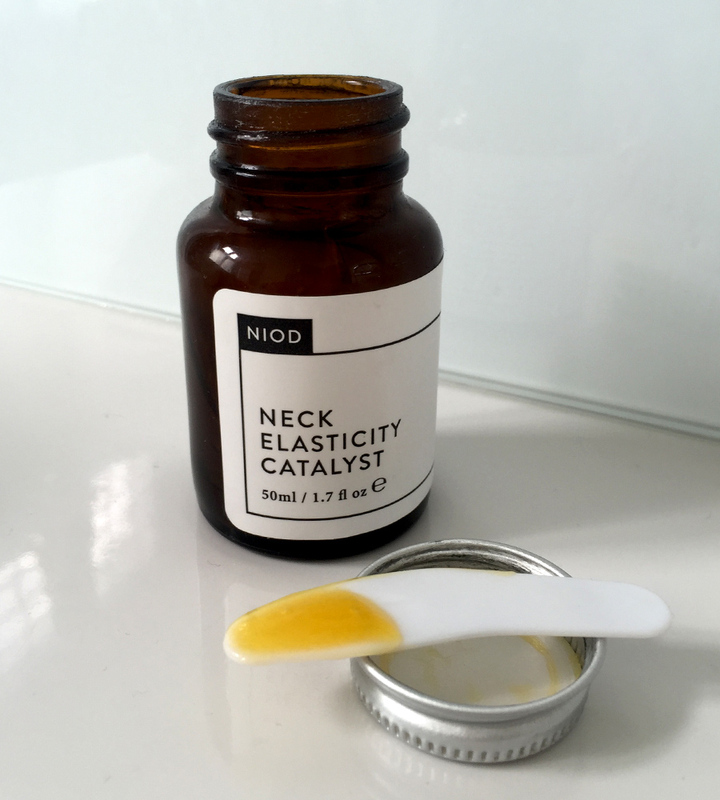 What price is the Neck Elasticity Catalyst? £50. I’ve had my jar for nearly 4 months now and not quite finished. Yes it goes on top of CAIS and MMHC. They also tell you quite clearly on the packaging and also how to use with other products you may have. Oops…threw away packages right away cos written too small….Sorry for the stupid question…will shut up from now on….